Have you sunken your teeth into the first season of the What We Do in the Shadows TV show on FX? 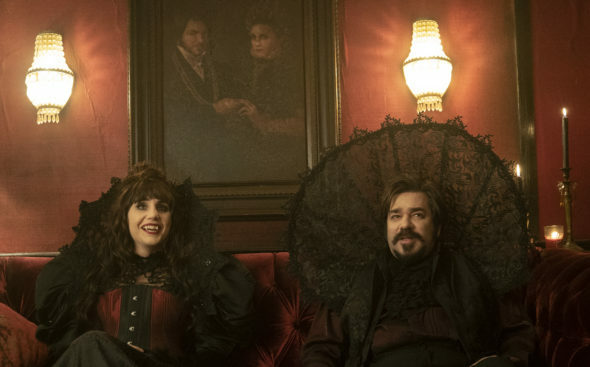 As we all know, the Nielsen ratings typically play a big role in determining whether a TV show like What We Do in the Shadows is cancelled or renewed for season two. Unfortunately, most of us do not live in Nielsen households. Because many viewers feel frustration when their viewing habits and opinions aren’t considered, we’d like to offer you the chance to rate all of the What We Do in the Shadows season one episodes here. A supernatural FX comedy, What We Do in the Shadows stars Matt Berry, Kayvan Novak, Natasia Demetriou, Harvey Guillén, and Mark Proksch. From creator Jemaine Clement, and based on the 2014 feature film from Clement and Taika Waititi, the documentary-style series (i.e. mockumentary) centers on a pack of vampires on Staten Island, who have been tasked with dominating the New World.